Are you wondering if a Dachshund might be a good pet to bring into your home? If you love small dogs and are looking for a loyal, loving canine companion, you just might find that a Dachshund is the ideal canine companion for you. Find out more about this breed and make an informed decision about whether or not you should bring one into your life. The Dachshund, often referred to as the weiner dog, is a highly recognizable hound breed, best known for its short legs, incredible length of back and very deep chest. Miniature: About ten pounds and standing up to 14 inches high. Toy: Up to eight pounds and standing up to 12 inches high. Two colors, with tan or cream markings over the eye, on each side of the jaw as well as under it, and also on various parts of the body and legs. The weiner dog is a bold little character, both feisty and affectionate. He can do well as a family pet, but should always be supervised with small children because he is more likely to be accidentally stepped on than larger, more visible breeds. Dachshunds tend to be a little headstrong, so it's important to be loving but firm with them or else your little canine will have you wagging your tail for him. These short-legged hounds are also known for being a little unpredictable. The sight of a squirrel may propel your dog into a chase without so much as a how do you do, so be sure to keep him on leash when you're out and about. On the other end of the spectrum, some dogs of this breed can actually be quite laid back. These are the ones to watch for excessive weight gain, which puts too much stress on those long backs and can lead to disc problems. As mentioned, the Dachshund has a strong personality and ideas of his own, which can make training a challenge. Potty training requires persistence and is best carried out when puppies are young. It is difficult to house break an adult Dachshund that never received training as a pup. Since training can be difficult, that's all the more reason to pursue it. Obedience training is highly recommended in order to gain a measure of control over your pet. Even if your pet doesn't go on to become a top winner in the obedience ring, you'll both still benefit from any manners he learns. All this being said, it's important to remember that every dog is an individual, and with proper socialization when young, some weiner dogs are quite capable of learning anything you care to teach them. Grooming your pet will depend on which type of coat it has. 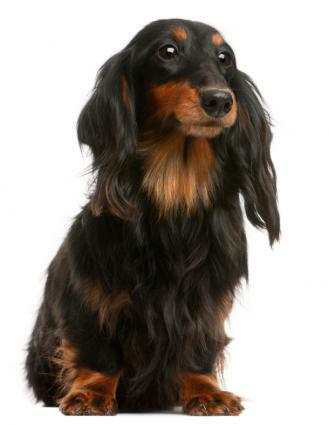 Long-haired Dachshunds will need regular brushing to remove tangles and debris picked up from the ground or field. A short-haired dog is less demanding, only requiring a wipe with a damp cloth in most cases to freshen him up and make his coat shine. 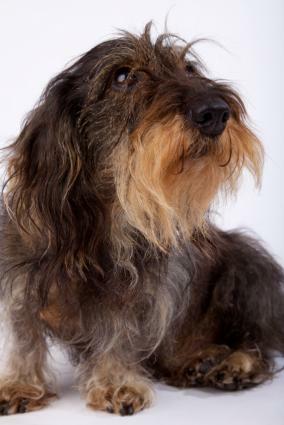 The wire-haired Dachshund presents the biggest challenge to keep him looking his best. Show specimens require hand stripping to remove excess coat and give a cleaner, more tailored appearance. Pet wire-haired Dachshunds are most easily maintained with two to three visits to a professional groomer each year. The nails should be clipped at least twice a month or as needed. Likewise, clean the ears twice a month with a cotton ball dipped in alcohol. This will keep your pet from developing an ear infection. Brush this dog's teeth at least two to three times a week to remove tartar and promote healthy gums. The average life expectancy for these dogs ranges between 10 and 15 years. According to the breed history as recorded at AKC.org, accounts of dogs that fit this description appear as early as the 15th century. They were bred to have the temperament and tenacity of a Terrier as well as the scenting and tracking ability of a hound. Originally developed in Germany, this hound's duty was to hunt down badgers, and so the breed evolved to be long and low to the ground, the perfect shape to dive down a badger hole. "Dachs" is actually the German word for badger, so the breed's name literally means "badger dog." It's not surprising that these dogs have a natural instinct to dig. Ready to Bring a Dachshund Home? Are you thinking that a Dachshund will make a wonderful addition to your household? 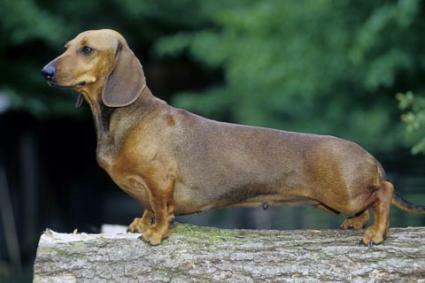 Learn more about the breed and look for a reputable breeder at Dachshund Club of America. If you like the idea of adopting a rescue dog rather than purchasing a new puppy, see Dachshund Rescue of North America.